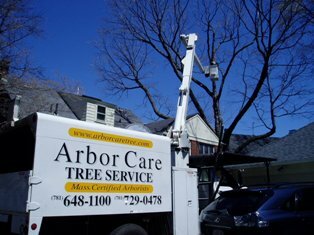 At ArborCare, tree and shrub pruning is more than simply cutting limbs away from nearby objects. We consider pruning an art, and an integral part of a lasting plant health care program. Properly pruned trees resist storm damage, pest and disease infestations, and are more natural looking. We have all the equipment and skills necessary to prune any tree, any where. Tree climbers available for zero access areas. Structural & Corrective Pruning: One of our main objectives at ArborCare is to promote proper pruning techniques. When a tree is young, it is essential to train the plant to grow properly and without structural defects. Unfortunately, many trees are left to grow wild for too long. Most of these trees have weak limbs and are often badly damaged from wind and storms. These weak trees are also extremely vulnerable to pest and disease invasion. 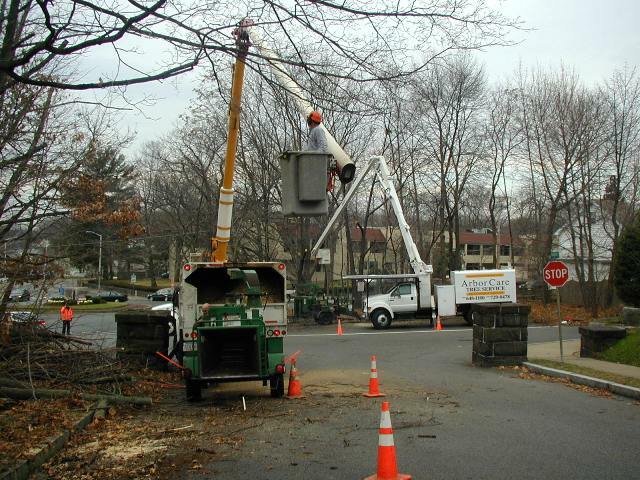 Trees should be inspected or pruned periodically to maintain proper form. Crown Thinning: Crown thinning is necessary on certain tree species. Excessive competition between limbs can lead to structural defects and dieback. Selectively removing competing growth will allow the remaining limbs to grow with proper taper and form. Sunlight will filter through the plant creating much needed interior growth, and the tree will live a longer healthier life. Natural Shrub Pruning: It may not be necessary to hand prune all of your landscape shrubs. Some hedges and other plants can be power trimmed if you desire a sheared appearance, but most broadleaf evergreens, and many needle types should be hand pruned to maintain natural plant form and to reduce physical damage caused by power tools. If you decide to power trim particular plants, be sure to keep tools clean and sharp. Crown Shaping: Crown shaping is not usually necessary on larger trees, but with smaller trees such as flowering ornamentals and fruit trees, corrective shaping may be necessary. A plant that has never been properly pruned is most likely out of proportion and is at risk of losing its natural form forever. Fruit Trees: Fruit trees come in all shapes and sizes. Depending on whether or not you're planning to harvest the fruit from your tree may depend on how you will need it pruned. We will give you a complete list of pruning options for your fruit trees and let you decide which method is best for you.